Why do we always want to be strong? Never be impressed, always “cool“ with everything, even when times are so hard? Maybe we think that it is necessary. Maybe we just want to prove it to ourselves. But maybe it is because some things just numb us at first. Eventually the truth of the last few hours, or days, sinks in and you realize what happened. Sometimes it is at night right before you fall asleep, sometimes in the middle of the day after a kind word… But at the latest at a nice dinner that finally achieves to crack your mental wall open. 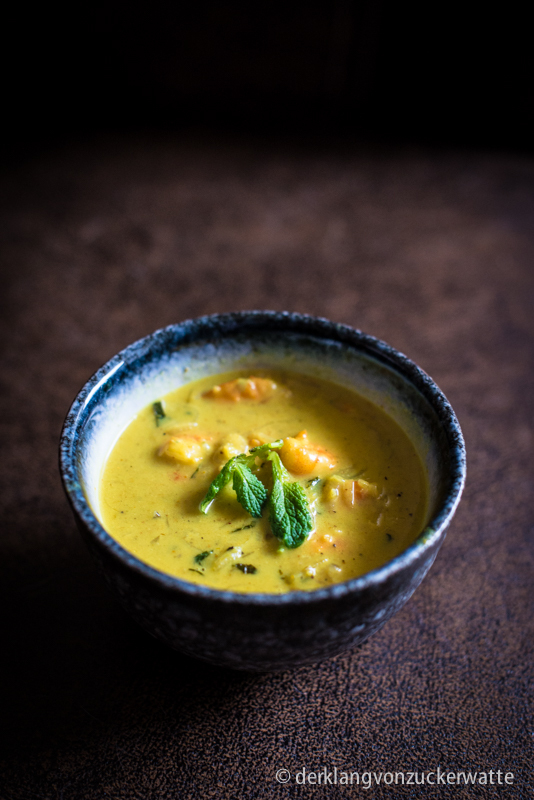 Suddenly there is nothing more soothing than an embrace from your most favourite person and this bowl with delicious shrimps and calming coconut curry. A little bit of rice to that… Heaven! Even at one of those dark days. Quickly wash the shrimps under running cold water. Peel the shallots and cut them into fine slices. Also peel the garlic and the ginger and chop them finely. Thoroughly crush the cumin and coriander seeds in a mortel. Put the oil in a pan over medium heat until hot, add the shallots and sweat – but do not brown – them. Add the shrimps and garlic, ginger and the spices. Stir-fry for about five minutes, then add the coconut milk, lime juice and finely chopped mint. Boil down for about 10 minutes until the sauce is a little bit thicker and to your liking. Add some salt and pepper for seasoning, divide the curry to two bowls and serve with some freshly steamed rice and a comforting glass of wine.